When looking through the collections to choose objects to post about on this blog, I’m always fascinated to find an object that can tell a story about the motivations behind design ideas: how the ideas of the time - whether political, moral, or aesthetic - and the personal beiliefs of the designer come together to inform the physical shape of an object. The object I’ve chosen this week is a chair made by the Norwegian woodcarver and designer, Lars Kinsarvik (1846-1925) between 1900 and 1905. It used to occupy a corner of our 'Burges Room' where works by William Burges sat side by side with Gothic Revival pieces, Arts & Crafts metal work, and other Victiorian ephemera. In 2005 it was displayed at the Victoria & Albert Museum as part of the International Arts & Crafts exhibition. In our new galleries the chair will have a more seperate space as we look at the more individual works in the collection. In it's previous location Kinsarvik's chair could be mistaken for a fantastical Norse curiousity: a picturesque plundering of design ideas from the Viking past, just as the Aesthetics looked to Japan, or the 18th century Gothick's looked to medieval castles. This chair was made with a different philosophy, one informed by British Arts and Crafts but one that evolved in a very different context. The British Arts and Crafts movement was interested in reviving lost crafts and methods of working in part as a response to the impact of the industrial revolution on both product design and the individuals dehumanised role in the production process. Norway, like many other smaller European countries was not heavily industrialised and these countries had there own reasons for looking at their cultural past. Norway at this time was not yet an independent country, having been controlled by Denmark for 400 years up to 1814 and then by Sweden up until it claimed independence following a referendum in 1905. Norwegian Romantic Nationalism emerged during the mid-years of the 19th century as a way of identifying, understanding, and raising the status of a Norwegian national culture. The people of Norway's cities felt that true Norwegian culture existed only in the country's rural communities and set out to record it. Composers and writers documented the melodies and lyrics of the folks songs of their country, just as Antonín Dvořák in Bohemia, or Bela Bartok in Hungary also did. In Norway and in many other smaller European countries people documented dances, folk tales and stories, collated poems and the myths of their countries, and published collections or compiled the folk legends into a national epic - such as the Kalevala in Finland. In Norway and Sweden open air museums were created to display buildings transported from the country to the city, one in Olso even includes a wooden 'Stave' church transported from 100 miles away in Gol. Archaeology also contributed to this sense of a reclaiming of a lost culture with the discovery and excavations of Viking ships at Tune in 1867, at Gostad in 1889, and a particularly impressive ship at Oseberg (detail pictured below left). ﻿﻿﻿Lars Kinsarvik was a designer and wood carver and has been described as an "enlightenment man, fiddler, poet and a goalkeeper". He studied with the Norwegian painter Anders Askevold in Bergen, then moved to establish a school in woodcarving in Hardanger. Later, he taught at a school of arts & crafts in Dovre and became a leading educational istitution and continues to have prominence today. Kinsarvik wanted to revive Norwegian folk art, and was particularly adept at Norse decoration, such as the 'Karveskurd' - the name given to the kind of geometrically symmetrical carving shown above. 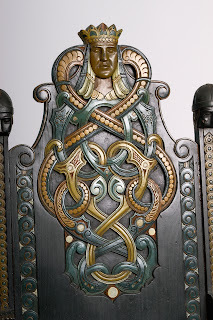 The style of his work became know as the 'Dragon' or 'Viking' style; it's motifs coming from details on Stave Church doorways and other sources of Viking age design. 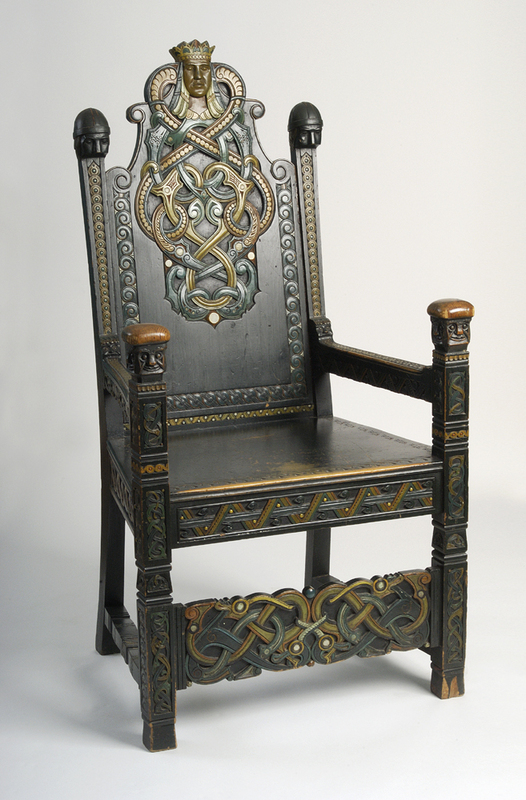 The main feature of the chair is this large symmetrical interlocking pattern culminating in a Queens head. 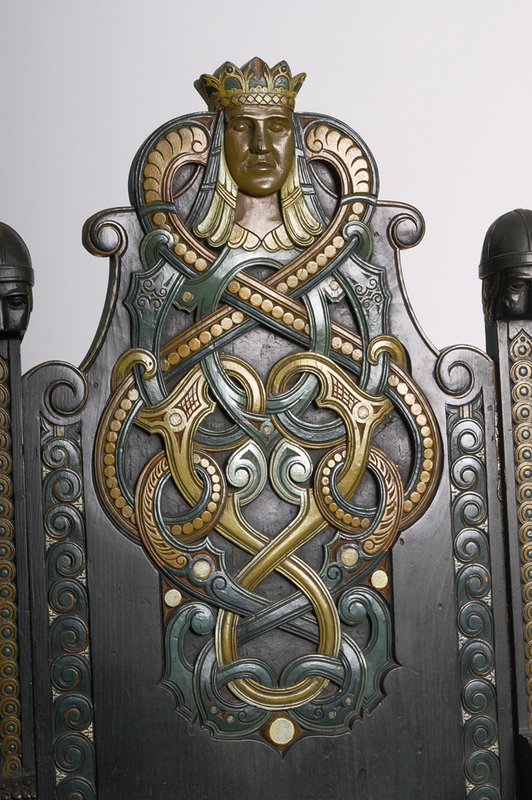 She is flanked on either side by the jawless heads of two Viking knights that rise out of the frame of the back rest. Whether the Queen is symbolic of a person real or mythological, or emblematic of something else, we are unsure. Kinsarvik's approach to furniture is to take a simple robust form in an easily carvable softwood and use it as platform for his sculputral forms, decorative reliefs, and paintwork. These forms and patterns aren't just playful historicism evoking Viking legends, but a serious attempt to contribute to a Norwegian national style at significant time in the country's history. The Lars Kinsarvik chair is now on display in the Design Gallery at The Higgins, Bedford if anyone would like to see the real article.